Since about the beginning of September life has been totally out of control. Work has been crazy busy and then as soon as work starts to slow down I do too out of sheer exhaustion. I suppose being 5 months pregnant doesn't help. Now that I can actually eat again and spend time in my kitchen without feeling nauseated (torture for someone who loves to cook and eat as much as I do!) I really find I am stretched for time and energy. I've taken to doing my own small-scale meal assembly on Sundays. I plan a menu for the week and assemble the ingredients for the main part of it. It might be chicken breasts that I marinate in lime, crushed coriander, honey and mustard (very tasty!) or a pot roast. Then all i have to do make sure I put it out to thaw (or into the slow cooker) in the morning and when I come home in the in the evening I finish it off and prepare a salad and side. It cuts the "I can't be bothered cooking" way down and we actually manage to eat healthily 5 nights out of 5 (except the odd indiscretion). It's really been working well and isn't too much of a chore at all as it takes me only about an hour on Sundays to get the meals together and into the freezer. This week, one of the meals I made was this slow-cooker lamb recipe which is dead easy to prepare and a twist on the usual Italian or French inspired wine or tomato-based braises that seems to predominate. You could prepare this ahead and freeze most of it, as I did, or you could just make it straight through. Either way, it's gorgeous, spicy and salty. Perfect over rice or just on its own and the lamb just melts in your mouth. This will serve 6 easily. more rice wine - about a half cup. If you're making this ahead to pop in your slow cooker later in the week, put the first 9 ingredients in a large zippered freezer bag and freeze until needed. 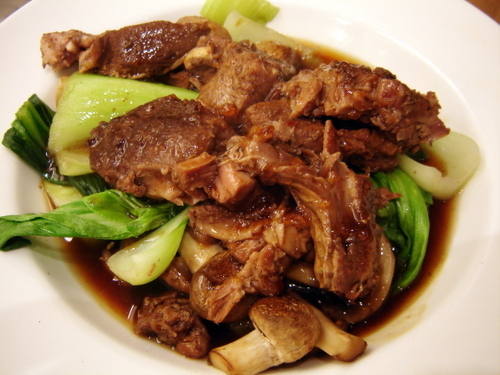 Otherwise, place all ingredients except bok choy and mushrooms, into the slow cooker and allow to cook for 6 to 8 hours. You can either saute the mushrooms and bok choy and make a bed out of them, or you can add them to the slow cooker towards the end of the cooking time - I'd say add the mushrooms with about 45 minutes left to go and the bok choy with about 15 minutes left. Once the meal is finished cooking, remove the meat and vegetables from the broth. Using a large wide-bottomed stir fry pan, reduce the cooking liquid until the flavour is strong enough for you. I reduced mine by half, but it will really depend on how much liquid evaporates from your slow cooker and whether you topped the liquid up at all during cooking. Use a bit more Chinese wine, into which you've stirred a few spoons full of cornstarch to thicken the sauce. Place a heap of rice (if you are serving it with rice) into the bottom of a big soup plate. On top of that, make a nest of bok choy and mushrooms. place some lamb pieces on top of the vegetables and ladle over some of the sauce. This also reheats well for lunch the next day! Ahhhh,... so you've taken up my Sunday Cookfest tradition. Cool, huh? Could I substitute the Chinese rice wine with Japanese sake? Oh, this is something Matt would adore. Me, I just love the smell of 5 spice powder. Btw; we have your German peasant soup in our recipe queue...with the current cold freeze, I'm sure I'll be making it soon! Dede - I don't see why you couldn't use sake - so long as it's not too sweet. Mmmm... I bet Chinese black mushrooms/shiitake would work really well in that dish. I'm just writing a post about five-spice powder, and will link to this wonderful recipe. I love the pairing of five-spice with lamb. Congratulations! I bet your baby will have all sorts of delicious things made for it - I remember trying out pumpkin with tahini on my then one-year-old, with reasonable success. Congrats on the baby. I just listened to your review on CBC. It was nice to hear your voice. My mouth is watering now for pita and hummus.